DELIGHTING IN HIM: Quilts again soon..
Last Christmas I dove into this project from my talented son. Though I had seen many t-shirt quilts over the years this is the way I chose to do Danielle's 6 years ago and David's 4 years ago. With running shirts the print can sometimes be very small and other times very large, by cutting out the designs I allowed for more variation and more shirts to be included. Some of the small designs in the middle are from sleeves or front right corners when the backs have large prints. This lets you get some of the name brand logos too. One of the small ones is actually from the top of a sock!! For Drew's I also sewed a couple of patches on the front of the quilt before backing it. 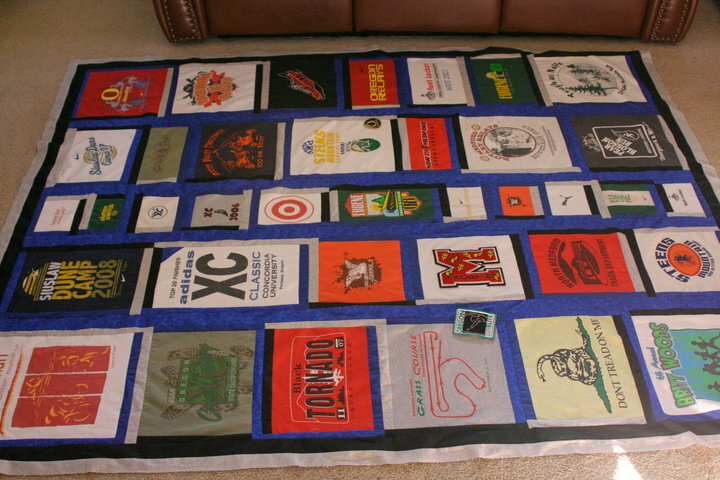 I also took his high school letter and sewed it onto a piece of T-shirt and used it as a square. Knowing I wanted this to be a large full size, when I had a lot of t-shirts cut out I lined them up by widths and started playing with it till I had my rows figured out. I then backed each t-shirt with heavy iron-on backing and quilted around the block with four different colors of fabric---Drew's color choices. When I was working down a row I tried to keep colors from touching at I attached each block. My strips were about 2 inches, I think. Then to give it a little more size and consistency I used the large blue strips in the middle and then black and gray around the edging in sizes to make it to what I was wanting. I just tied this to finish. It was so much fun and everyone I have made them for has really enjoyed them. So now with no runners in the next couple of years what am I to do? Well I will be starting in January on one for Drew and Danielle's high school cross country coach. He is getting married this summer and I wanted to gift him with a special memory of his own.